BLOOMINGTON, Ind. -- Indiana University President Michael A. McRobbie announced on Friday (Oct. 8) the conclusion of the Matching the Promise campaign for IU Bloomington, which raised $1.144 billion, exceeding its initial goal of $1 billion and making it the most successful campaign in IU history. "This is an historic day for Indiana University," McRobbie said. "By far surpassing our initial goal for this campaign -- and accomplishing this extraordinary feat in the midst of an economic recession -- we are making an IU education affordable and accessible to deserving students. We are also greatly strengthening the academic environment of the Bloomington campus, where two of our schools -- the Jacobs School of Music and Maurer School of Law -- were renamed in honor of individuals who made unprecedented and extraordinary gifts as part of the Matching the Promise campaign." "So many individuals deserve our deepest gratitude for their commitment to philanthropy in support of education and making the dreams of so many students and their families come true," he added. McRobbie made the announcement during a celebration of the conclusion of the campaign at IU Bloomington's Henke Hall of Champions. The campaign, launched in July 2003, has played a major role in helping IU Bloomington students finance their college education through the funding of scholarships and fellowships, while also enabling the creation of new faculty chairs and the construction of high-quality teaching and research facilities. The original goal of the campaign was $1 billion. In 2009, the goal was raised by $100 million to $1.1 billion. McRobbie said that the campaign has reduced the average out-of-pocket cost for in-state students by $1,200 or 12 percent, over the last four years, resulting in IU Bloomington having the lowest net cost in the Big Ten, according to the U.S. Department of Education's new College Navigator Web site. The campaign raised $338.3 million for undergraduate and graduate student support, said IU Executive Vice President and IU Bloomington Provost Karen Hanson. To date, 536 IU Bloomington undergraduates already have received MTP scholarships, and 590 graduate students have received MTP fellowships. 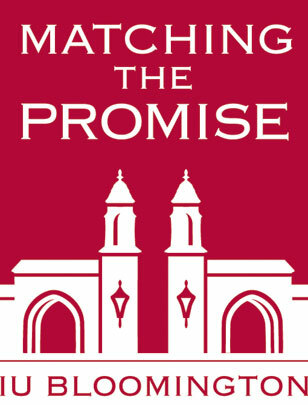 "This generosity of those who donated to the Matching the Promise campaign has had -- and will continue to have -- a monumental effect on the campus," said Hanson. "It has allowed us to attract and retain outstanding faculty and students and to build state-of-the-art facilities. These transformational gifts will serve to magnify the contributions that Indiana University can make to the state, the nation and the world. "The campaign changed the face of IU Bloomington," she added. The largest gift for scholarships in IU history came from former Indianapolis residents Jesse and Beulah Cox and their estate. They provided a total of $86 million for working students, of which $57.4 million is dedicated to IU Bloomington students. Among other significant scholarship support, Michael S. "Mickey" Maurer and his wife, Janie, committed $35 million for student scholarships at the Maurer School of Law; William J. Godfrey gave $25 million for the Kelley School of Business for need-based scholarships and also to fund the William J. Godfrey Graduate and Executive Education Center; the Glaubinger Foundation, on behalf of Larry and Lucienne Glaubinger, gave $20 million for student-athletes in non-revenue Olympic sports and for the Adam Herbert Scholar-Athletes Fund; and William R. Fry gave $15 million for undergraduate scholarships in the Kelley School of Business. University officials praised the timing of this support, citing data from the Lumina Foundation for Education indicating that the U.S. has fallen from first to fourth in the world in the proportion of adults holding two- or four-year college degrees. Among young adults 25 to 34, the U.S. is tied for 10th. Indiana is well below the national average. Officials also pointed out the increased demand for higher education in recent years, including the fact that IU has set records for university-wide enrollment in each of the past three years, topped by this fall's mark of 109,445 students. According to Giving USA, the annual measure of American philanthropy, giving to higher education declined nationally by 3.6 percent in the past year, said Gene Tempel, president of the IU Foundation, which is charged by IU with leading and coordinating fundraising campaigns. Despite the national decline, though, giving to IU overall rose 43 percent in the past year. "The university has truly committed donors and friends," Tempel said. "All of us at IU are proud to be their partners, and thrilled at the successes of this most recent record-setting campaign. Only a few other universities have conducted campaigns with billion-dollar goals, and fewer still have completed more than one." In all, more than 188,000 alumni and friends made gifts to the campaign, including more than 71,000 first-time donors, Tempel said. More than 5,500 corporations and foundations made gifts. IU Bloomington Provost Hanson credited the campaign for allowing the university to construct new facilities that are enhancing teaching, learning, collaboration and research at the Bloomington campus. The Jacobs School of Music received $44 million from the Lilly Endowment to construct and equip a studio building that will provide technologically and acoustically superior teaching and practice facilities to rival those of any music school or conservatory in the world. An anonymous donor gave $15 million for the renovation and expansion of the undergraduate facility in the Kelley School of Business, which will transform the undergraduate program. The Cook Group gave $15 million for enhancements to a new basketball development center -- named last spring as Cook Hall -- and to benefit the men's and women's basketball programs. Its gift was the largest in the history of the department of athletics. IU Bloomington has been able to recruit and retain some of the finest teachers, scholars and researchers with gifts like that of Barbara and David H. Jacobs, who gave $40.6 million to the Jacobs School of Music for endowed faculty positions as well as for scholarships and fellowships. Additionally, the Maurer School of Law received $25 million from the Lilly Endowment to attract and retain world-class teachers and scholars and to establish the school as one of the very best public university law schools in the country.